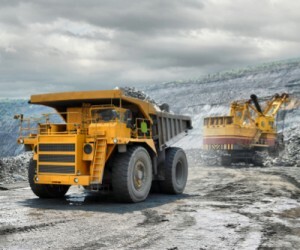 With the ongoing spending cuts global miners may be paving the way for a major supply shortage, says Wood Mackenzie. While miners are holding off on new projects and looking to slow the completion of ones in the works as they face the worst commodity price collapse since 2008, research house Wood Mackenzie warns the industry could be paving the way for a major supply shortage. In a presentation prepared for clients at LME Week in London, the firm’s vice chairman of metals and mining research, Julian Kettle, draws together the overall outlook for metals, citing the challenges of lower commodity prices, pressure from shareholders to curtail investment and a new reality of lower demand growth. Wood Mackenzie concludes that if the industry fails to invest the US$150 billion required to meet future supply needs, looming supply shortages will follow. "The need for investment is becoming desperate in zinc and lead and will be an issue in copper in the next few years,” Kettle writes. “Unfortunately there is little appetite to invest with prices cutting into the cost curve, low free cash-flow, surpluses building, difficulty in financing and shareholders demanding dividends." Across base metals, Wood Mackenzie predicts that iron ore and steel Chinese consumption growth rates will continue to fall dramatically until 2020, compared with the past five years. Far from being interpreted as a bleak outlook, this view is somehow optimist, as the research house believes that Chinese demand hasn't hit a great wall just yet. “The scale effect, i.e. the sheer volume, still translates into significant incremental demand and good growth in tonnage terms. 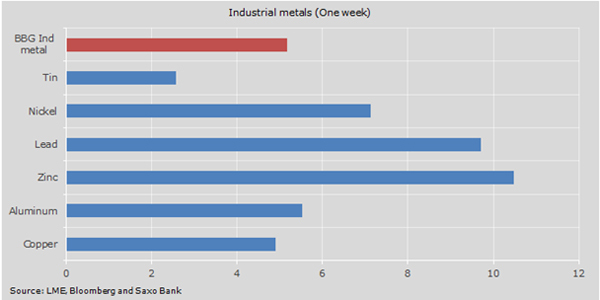 China will account for between 58-69% of global total demand growth for base metals over the next decade," Kettle notes. While producers have reacted to sustained lower prices since 2011 with some production cuts, Wood Mackenzie's analysis reveals that across base metals, further output reductions are needed to ensure production is economic at current prices..
Mehr und mehr einflussreiche Spieler ziehen sich aus dem hoch kontroversen Edelmetallgeschäft zurück..
LONDON – Mitsui will close its precious metals businesses in London and New York at the end of this year, two sources familiar with the situation said, owing to sliding commodity prices and more stringent regulation. "Mitsui is shutting down precious in London and New York in December," one source said. A spokesperson for the Japanese trading house declined to comment. Mitsui, which started trading precious metals in 1970, is the latest to join a retreat by banks and brokers from some commodity markets as profits and prices tumble on concern about slowing Chinese economic growth. Mitsui & Co Precious Metals, a wholly-owned subsidiary of Mitsui & Co incorporated in the US, has a team of about 50 trading gold, silver, platinum, palladium, rhodium, ruthenium and iridium from offices in Hong Kong, London and New York. The sources did not know how many jobs would be affected across trading, sales and research. Mitsui trades precious metals on the Tokyo Commodity Exchange in Japan and also has offices in Hong Kong. "The decision will affect global operations, as it will reduce volumes," the second source said. The trading house also participates in the twice-daily auction setting the London silver benchmark run by the Chicago Mercantile Exchange and Thomson Reuters. Its withdrawal would leave five banks to set the price. Last month, Mitsui was included by Switzerland's competition authority WEKO on a list of banks being investigated for possible collusion over the pricing of precious metals. Mitsui not only joins Western banks, including Barclays and Deutsche Bank, in cutting back on commodities, but also Mitsubishi UFJ Securities International, which withdrew from its London-based commodities business, last year. Commodities trading revenue for ten of the world's biggest banks continued to fall to $2.6-billion in the first half of 2015, compared with $3.5-billion in the same 2014 period, according to estimates from analytics firm Coalition. Kampf der Minengiganten. Während Glencore massive Produktionskürzungen in Aussicht stellt, visiert Rio Tinto die Ausweitung der Marktmacht im Minen-Sektor an. Der eiskalte Kampf um Marktanteile geht in die nächste Runde. Rio Tinto (RIO -2.1%) again warns that it will not cut copper production even though current prices of the metal do not reflect fundamentals, saying it would be illogical to hold back output and leave space in the market for higher-cost rivals. The comments from Jean-Sebastien Jacques, Rio's head of copper and coal, come just days after Glencore said it would cut its zinc output by a third after the price of the metal fell to five-year lows. Jacques says concerns about weak demand from China are overblown and that the second half of the year was shaping up to be better than the first half. He also says copper prices are not likely to recover in the near term because hedge funds are using the commodity as a way to place bearish bets on China. Bizarre Entwicklung am einflussreichen Repomarkt in den USA. "..Jean-Sébastien Jacques, the copper and coal chief executive officer at Rio Tinto Group, talks about copper prices and demand in China. He speaks with Bloomberg Television's Jonathan Ferro in London. (Source: Bloomberg)." Nach einer der brutalsten Bärenmarkt-Phasen aller Zeiten (3. Quartal 2015), kommt der Ausverkauf in der Minenbranche Anfang Oktober zu einem Halt. Glencore ist einer der Hauptgründe..
Over the past week crude oil prices have jumped 13%, platinum is up 8%, copper 4.8% and industrial metals 5.2% on average after double digit gains for zinc. Aluminum gained more than 5% over the week while benchmark iron ore price advanced by the same margin. Even after including more modest advances for the agricultural sector (cocoa is the sole commodity that lost value) it's been the best week for commodities (as per the Bloomberg Commodity Index) since July 2012. The change in sentiment was also in evidence on stock markets, with the sector's heavyweights rallying across the board. The world's number one miner BHP Billiton which also has significant exposure to oil markets jumped more than 14% for the week. Iron ore's top producers Rio Tinto and Vale soared with the Brazilian company adding one fifth to its value. 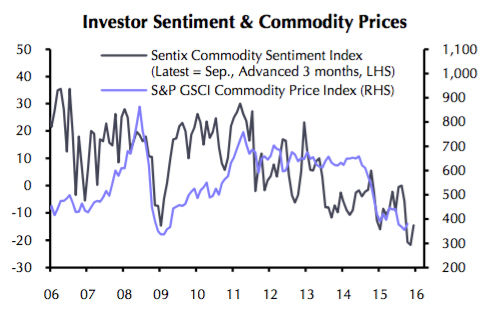 A new note by Capital Economics argues that the "turn for commodities is nigh (if it hasn't already happened)". "Indeed, the raft of negative media headlines and the capitulation of some of the few remaining perma-bulls among the investment banks has now been followed up by dire warnings from the IMF and central bank regulators, which a cynic would say is a sure sign that the things are about to get better!" "Prices tend to recover much more slowly from a supply-driven downturn than from a demand-induced drop as producers often try to make up for the shortfall in revenue by increasing production wherever possible." While many analysts including those working for Goldman Sachs, UBS and others remain pessimistic about the outlook for metals and mining, Morgan Stanley last week made a definite switch to the bull camp. [Morgan Stanley analysts] see commodity prices rising 19% by 2017, adding this “would be a sharp reversal from the experience in the last 18 months.” Equities exposed to the sector, they said, will likely outperform. “Emerging markets and China in particular remain key to commodities demand. In the next few months we expect the perception around this demand to improve. 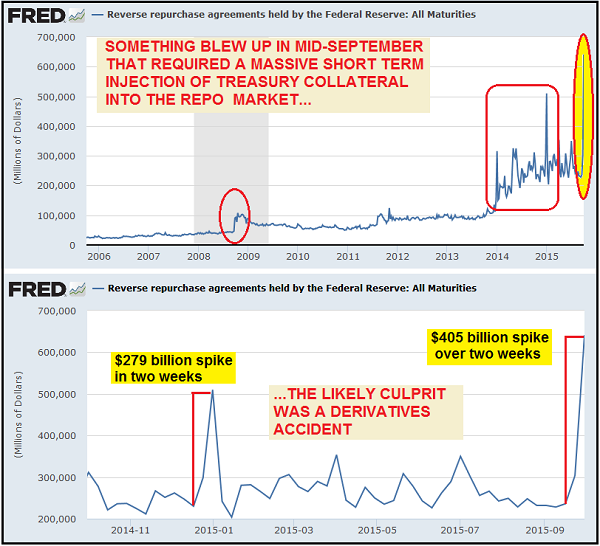 In particular the acceleration of financial and administrative stimulus policies in China in recent weeks should start to feed through in both actual activity levels and equity market expectations,” they wrote..